Jesus said that He was the light of the world. His light is indistinguishable, regardless of how dark the world is, the light is more powerful. A few years ago I visited a cave in Mt. Elgon, Kenya. I walked as far back as I could go in the cave and switched off my mini Maglite. It was so dark that I could not see my hand in front of my face, but when I turned on my flashlight, the darkness had to flee away. No matter how dark the cave, the light overpowered the darkness. This incident in the cave made me think of our lives as Christians; like Jesus, we are very powerful because of God’s light in us. The darkness cannot overpower the light. Jesus is the Light of the world, but He also called us the light of the world. When we were saved, the power of God rescued us out of the kingdom of darkness and placed us in the Kingdom of Light. (Colossians 1:13) In fact, 1 Peter 2:9 says that we were called out of darkness into His marvelous light. The transforming power of God’s redemption makes us different in attitude and behavior, and as a result, we shine out in their world. The world may be dark, but the redeemed of the Lord will be visible and victorious. This light is attractive to those who are being saved, and the same light enrages our opponents. Those who are hostile to the Gospel are going to seek to extinguish the light because it reveals their wickedness. They mistakenly think that by ridding the light and muting our voice that they can then continue their evil practices. They believe that by eliminating the world of Christians that they will be able to express their freedom without our disapproval. The truth is, they are not opposing us as Christians, but they resist the light in us; this light is the glory of God found only in Jesus. 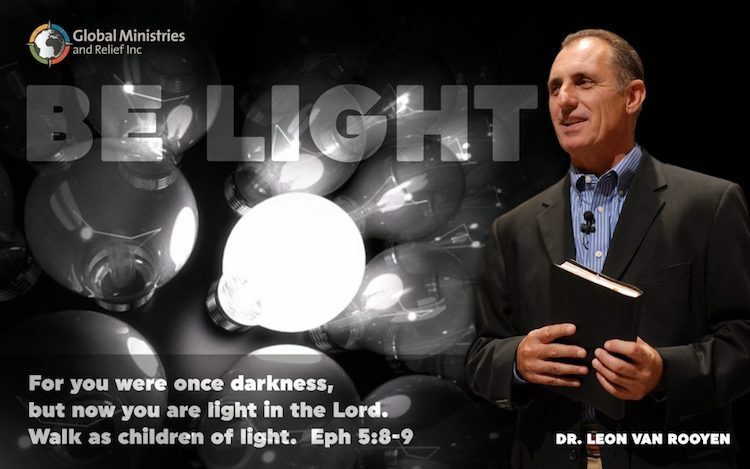 This light is not our superior morality or personal purity, but it is the very presence of Christ in us. 2 Corinthians 4:3-7 (NLT) If the Good News we preach is hidden behind a veil, it is hidden only from people who are perishing. Satan, who is the god of this world, has blinded the minds of those who don’t believe. They are unable to see the glorious light of the Good News. They don’t understand this message about the glory of Christ, who is the exact likeness of God. You see, we don’t go around preaching about ourselves. We preach that Jesus Christ is Lord, and we ourselves are your servants for Jesus’ sake. For God, who said, “Let there be light in the darkness,” has made this light shine in our hearts so we could know the glory of God that is seen in the face of Jesus Christ. We now have this light shining in our hearts, but we ourselves are like fragile clay jars containing this great treasure. This makes it clear that our great power is from God, not from ourselves. When we share the Gospel, it can turn people from darkness to light, and from the control of Satan to the Living God. No wonder the Apostle Paul was not ashamed of the Gospel, because it is the power of God to change people’s lives, deliver them from the grip of Satan, and grant them the new creation miracle. We, the saints of God, are entrusted with the Gospel. When we share the Good News, we are carriers of God’s light to those in darkness. Our message to the suffering, the poor and those in need, is made attractive when supported by compassionate acts of kindness. Our good works are a way of shining brightly into the world around us. Jesus taught the disciples to be engaged in helping the suffering. The disciples followed His example and made this a major part of their ministry. True religion is to care for widows and orphans. Sadly, many Christians today are not engaged in good works. They feel that the suffering and need is too big, and their few dollars will not make an impact in the sea of desperate need. Jesus said that we should let our light shine; this light is our good works and as a result, God will be glorified. When we give compassionate aid to the hurting we shine in their world of pain. Our gifts make way for us to reveal the love of God and gives us an entrance to proclaim the Gospel. In conclusion, arise shine, be radiant, display the glory of God to your world, (Isaiah 60:1) through your message, your life, and your good works.